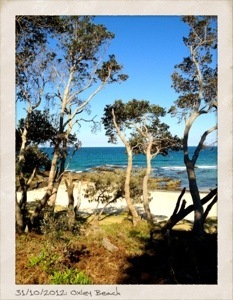 Another warm sunny day in Port Macquarie. This morning after breakfast I wandered into town for coffee (of course) and a spot of shopping. 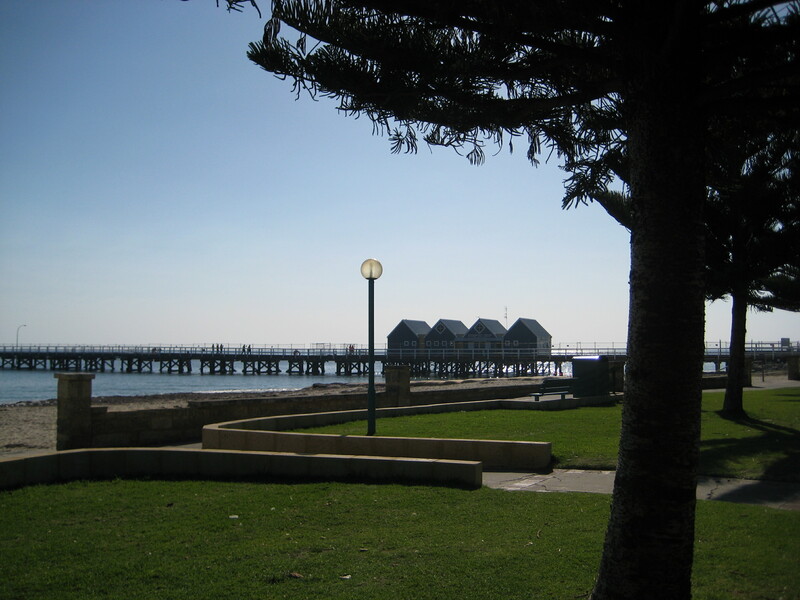 Later in the afternoon I set off on another walk along the beaches to Flynn’s Beach before turning and heading back through town to where Mr N was fishing. All in all a quiet day involving a bit of walking. After a very restless night with not a lot of sleep, I was up at 4.20am to get ready for the half ironman triathlon. Brekkie, last minute packing and checking lists, into the trisuit and then we were off to transition. Managed to catch up with tri buddy Keren in transition. After setting out the things that would be needed for the cycle & run legs, I grabbed my wetsuit, cap & goggles and we left transition. The waiting before the event is the worst part of triathlon & there was some of that this morning. We got into our wetsuits and then headed over to the swim start. Nerves were starting to go into hyperdrive at this point. The swim was ok. I got off to a bad start, getting caught in the middle of a group creating lots of turbulence and arms and legs going everywhere. 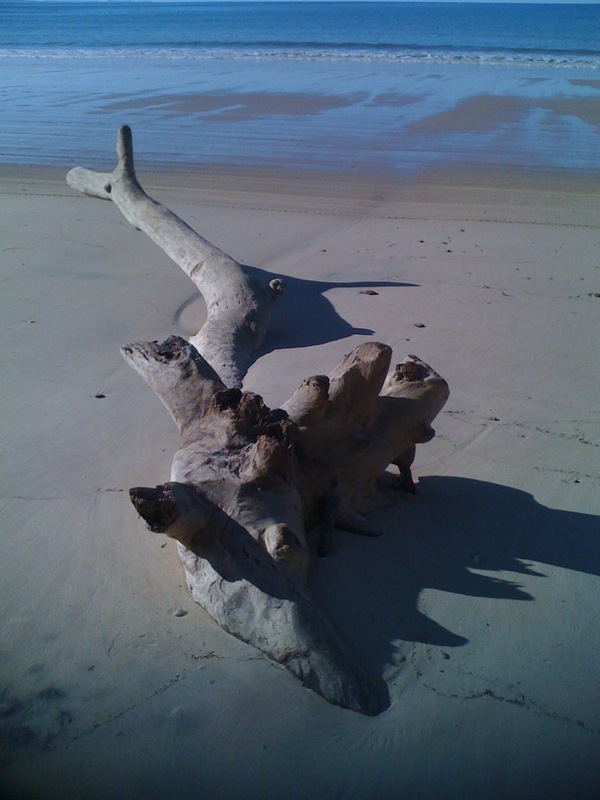 It did settle down and I found my own space….until the men came through. Well, I got swim over, swum into, narrowly missed getting kicked in the head. It was a little scary there for a while. And the finish didn’t seem to be getting any closer. But finish I did in 43.41min. The bike course had almost psyched me out before we even started. It’s hilly, very hilly and on the flat part we had a headwind one way. I decided to take it easy on the course as my goal was to finish within the cut offs – 4:45hr from start of event. There is one really hard hill on Matthew Flinders Drive which was really doing my head in. There is carpet laid down the side of this road for those who don’t feel they can cycle up the hill. I decided to walk it because I didn’t want to embarrass myself in front of crowds of people watching in case I toppled over part way up! I need to retain some shred of dignity! At the top I turned to see Keren behind me, doing the same thing! It was so good to see her at this point. We had a little chat and then set off again. Two laps later and I was heading into transition again. The bike leg took me 3:42:18hr. So relieved to get off! Finally the run leg. It wasn’t a fast 21km by any stretch of the imagination. I think the hills on the bike killed my legs. It took me a few kms to get into any semblance of rhythm. I ended up doing a mix of running and walking. Running when I felt ok, walking when I felt like crap. My goal was to make it to each aid station which were 2km apart. Saw Keren several times on the run as it was a 2 lap course. She was looking good and wasn’t too far behind me. Finally the finish shute came into sight. I would be able to stop very soon! 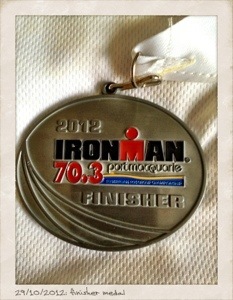 And then I was running across the finishers mat and was given a medal. 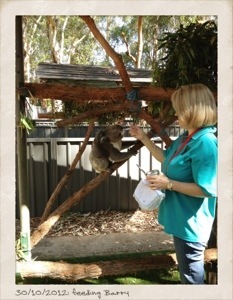 And one of the volunteers was an ex-Canberra girl who I used to do triathlons with! 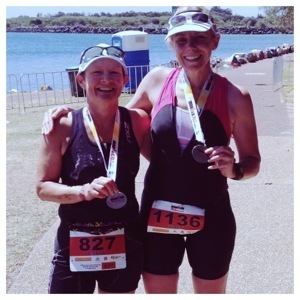 Mind you she has gone on to bigger and better things like Hawaii ironman and winning her age group in Auckland recently. The run time was 2:09:28hr and my total time was 6:41:42hr! Keren finished not long after. It was awesome! We had accomplished what we set out to do. We had both been worried about making the cut offs because of the hilly course (Keren tells me there were over 70 of them) but we did it! And the photo tells the story!! One sleep to go though I doubt there will be too much sleep to be honest. But I’m as ready as I’ll ever be so really it’s just a case of getting out there & doing it regardless. After another interrupted night’s sleep I got up early to do my last training session: 10min cycle & 10min run. I decided against a swim – that was too much hassle. I headed off down the street until I reached the end & then turned left. Smack into a steep hill. I was totally unprepared & in the wrong gearing. I tried standing & that didn’t help either. I was weaving all over the road & I was pretty positive that I was not going to make it & would topple over. Amazing how the self preservation instinct kicks in! Somehow I made it to the top & down the other side before going up another shorter hill. Any other hills after that first one felt relatively easy! And I probably gave any residents of that street who happened to look out their windows a good laugh for the day! Keren & Darrell joined us a bit later in the morning for coffee, and for Keren and me, more carbs! It was so good to catch up with Keren and share how I was feeling, as she was feeling the same. AND we have the same bike, just different colours. That’s reassuring. 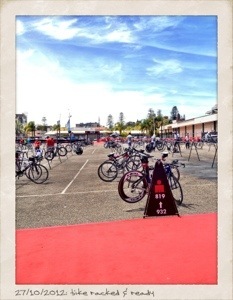 Then came the parts of triathlon that I don’t like because it freaks me out – bike check in & race briefing. It makes it all seem so serious & technical & a big deal. I also attended a transition tour to check out all the exit and entry points. Seems my bike is fairly central to these points so shouldn’t be too hard to find. We drove part of the course again this afternoon (you can’t half tell I’m nervous!) so I could see Matthew Flinders Drive again – its a hill they refer to as their Heartbreak Hill. Then I made Mr N drive up the hill I rode this morning to compare and this morning’s hill was steeper so I feel a bit better 🙂 It wasn’t pretty this morning but I made it to the top! Tomorrow I will be prepared. I’ve checked & re-checked my race day checklist. Everything is laid out on the spare bed. Sports drinks have been prepared. Tomorrow: the plan is to get up about 4.30am, have breakfast & head to transition about 5.30-5.45am. Swim start is 6.56am. I hope to finish between 2-2.30pm. Woke up to a very blustery morning. I went for a 6km run about 8am & that wind was brutal. Lets hope Sunday morning isn’t like that. The run was along the breakwall and into the town centre where the tents have been set up for Sunday. Lots of people out walking, not so many running. I had to hang onto my cap at one stage as the wind threatened to blow it off. 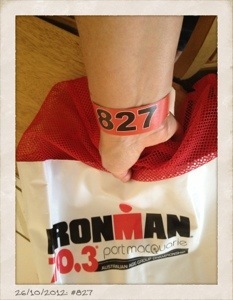 Checked in this afternoon at IM central & collected my race pack. They also tagged me – a wristband which is compulsory to gain access to transition, etc. I’ve been reduced to a number – # 827! One suitcase, one large Nike sports bag, one backpack, a cooler bag, wet suit bag and one bike…….I think I’ve packed everything. Well the bike isn’t packed – it’s still sitting on the wind trainer. Note to self – don’t forget bike tomorrow! A batch of banana muffins made, tomorrow’s lunch prepared, snacks for the trip – all ready to be packed. The car GPS (Garmin Nuvi) maps updated and charged. I have finally figured out where I was going wrong when trying to update (previously unsuccessfully) the maps. Tonight I figured it out! Yay for me! Chargers for the iPod, iPhone, iPad and Garmin watch – packed. Checklist for son #2 who is staying at our house while we are away to babysit the cat – done. Food to feed him for 12 days – bought. Have I forgotten anything? I have been through my checklist several times. As long as I don’t forget one of my bags I’m right! I’ve rung and double checked our accommodation booking – I’m not taking any chances! All of this busyness actually serves another purpose – keeps my mind off the upcoming event! I very nearly slept in this morning. Mr N has already started his holidays but I had another day of work to get through, plus one last training session. When the alarm went off this morning I had forgotten that Mr N did not have to get up for work. Twenty minutes later I realised that no, there was no coffee on my bedside table, in fact no-one else was up, except the cat who was becoming increasingly irate that no-one was up feeding her, given the alarm had gone off earlier. I had a good session in the pool this morning. Amazing how focused you get in your training, the closer the event gets! Knowing this was my last swim session here before we leave tomorrow definitely ensured that I put all my effort into the ‘hard’ sections of the session. Tomorrow we leave on our road trip and big adventure!. Starting to finalise what I can at work before going on leave. However I know that much of it I will come back to deal with in a couple of weeks! We had an afternoon tea to celebrate a colleague’s birthday this afternoon – homemade cheesecake, chocolates from Borneo, almond biscuits, cupcakes and so it goes! Tonight I have pulled out my large sports bag and checklist for Sunday – I am starting to put together what I need for a swim,cycle,run event. There’s so much stuff to pack. 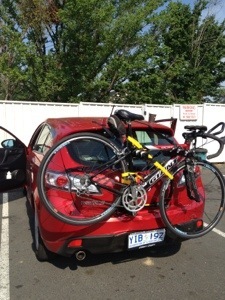 Not only can triathlon be an expensive sport, it is also a hassle when it comes to travelling. You cannot travel lightly when you have to cart a bike and all the other stuff that goes to doing the event. And lets not forget the paperwork – I still haven’t received my membership card in the post so I have to take paperwork related with paying for my membership on-line. 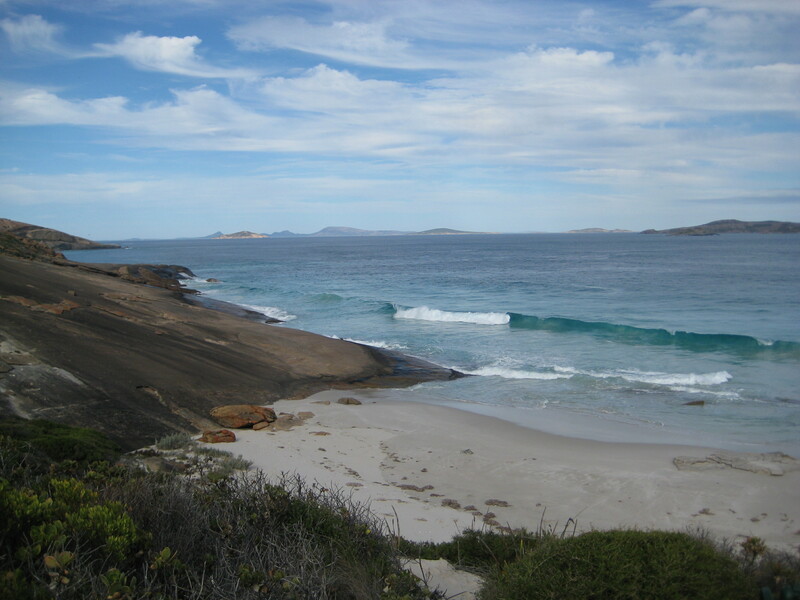 Tomorrow: the plan is to do a swim session early in the morning then that’s it until I get to Port Macquarie. Not long to go now! One day of work done and two to go before we leave for Port Macquarie. Have I started packing? No. Have I thought about starting to pack? Yes. But thinking and doing are two very different things! Besides I still have a couple of training sessions to get done before I commit to packing. Tonight it was a 40 minute intervals session on the bike, a nice change from the usual 60+ minutes I’ve been doing. It wasn’t exactly a warm evening night to be outside and on the bike. There has been a very cold wind blowing today. I have started to keep a close eye on the weather for Port Macquarie and hoping and praying that they don’t have another hot day like they experienced last Saturday. At the moment the forecast for Sunday is for a possible morning shower, partly cloudy, 8-21 degrees. Wind might be a problem and it looks to be south to southwesterly. Had lunch with a good friend at Two Before Ten cafe. It was great to catch up and have a chat.